For the second weekend in a row it was the Godolphin blue on top at Caulfield on Saturday. The drama of the Cup came right down to the wire as Irish international stayer Best Solution won in a photo finish, and after entering at long $13.00 odds, it was another Caulfield Cup win for trainer Saeed Bin Suroor, the fourth of his career. 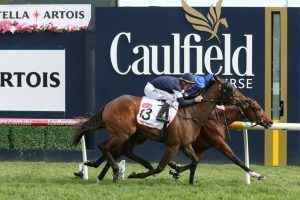 Best Solution won the 2018 Caulfield Cup by half a head on Saturday. “This year we’ve had very good results, some very big horses” Suroor said after the race. Just a week removed from Benbatl’s win in the Caulfield Stakes last weekend, it’s been a successful Spring so far not only for Godolphin, but also for winning jockey Pat Cosgrave. “Caulfield is just a great place, I’ve ridden two big winners here in my career now” Cosgrave said following Saturday’s win. Despite the elation, he admits he didn’t think his five-year old had enough left in the tank to nab a win at the line. “It was five deep around the turn here, and I had to sort of wait and wait, and I thought I used a bit too much to get there” Cosgrave said. The $5 million feature got off to an unexpected start with Jon Snow jumping the gates early, but after Ace High set a cracking pace from the barriers, Godolphin’s chances dramatically increased after following a similar race line to Homesman around the bend. “I said to him, when the doors open, you need to be somewhere behind” Suroor said. Arriving on Australian soil only earlier this month, the multiple German Group 1 winner could potentially go on to the Melbourne Cup (3200m) next month. For the time being though, the stable aren’t making any big decisions. “Another big race, another dream for us, but we’ll try” Suroor went on to say. Even so, Best Solution has firmed from $21 into $11 ahead of the race that stops the nation. As for the other Cup hopefuls, Homesman enjoyed a very strong run to finish second, while fellow Irish hopeful The Cliffsofmoher ran third.